Reactions to foods are becoming all too common and Jan has a wealth of experience helping people with food sensitivities (food intolerance) and coeliac disease. To investigate the cause of your food reactions, Jan might suggest some investigation into the health of your digestive system. Reason being more often than not food intolerance is the result of an imbalance of gut flora, parasites, overgrowth of yeast, or even a bacterial infection. These really need to be attended to first to improve the health of the digestive system and to strengthen the gut wall. Once that is treated if you are still experiencing reactions to foods, Jan will suggest a food sensitivity / food intolerance test to determine which foods are the culprits. Depending on the patient's wishes, Jan may suggest postponing food testing until after the patient has undergone gut healing work. An unbalanced, weak digestive system will often result in more reactions to foods and the resulting list of reactive foods can be overwhelming. In addition, the test results may not be a true reflection of the foods the person is truly sensitive to should they have healthy digestive function. Jan’s book, The Eat Well Cookbook, is gluten- and dairy-free and was written because so many people suffer reactions from eating foods such as wheat, dairy and other gluten-containing grains. In clinic, Jan uses a variety of testing methods to determine which foods are potential problems for her patients once she has treated any gut issues. This may include IgG Food Intolerance testing or ALCAT Food Intolerance testing. 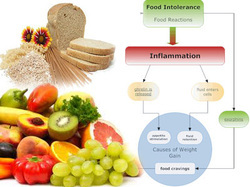 While food intolerance tests are not 100 percent conclusive they pinpoint foods that the immune system is strongly reacting to. Eliminating the reactive foods or eating them on a rotation basis, the symptoms then improve. Through dietary tweaks and nutritional and herbal medicine Jan helps her clients become less reactive, reducing symptoms dramatically. Essentially Jan's approach is for long term results and not just applying a bandaid solution to mask symptoms. Many people comment on how other symptoms improve such as rashes, fatigue, headaches, hormone balance, itchy eyes, mood and concentration. This is because the digestive system is such an important part of your immune system and if it's not working as well as possible, symptoms can develop that may not seem related.